A perpetual pickup game in the Smith Fieldhouse is notable, not for high-flying dunks or amazing speed, but for the players who just keep showing up. Gathering for triweekly pickup games, this group of lunch-hour basketball warriors knows the meaning of teamwork and endurance on and off the court. Photo by Bradley Slade. With yellow practice jerseys and a borrowed basketball, I jog over to the Smith Fieldhouse. As I cross the white stripes and blue lanes of the indoor track, I anticipate, then hear, the thump of a ball, the short squeals of hightops on hardwood, and the nearly noiseless whoosh as players run the court. The rhythmic dribbling takes me back to my grade-school days. To shorten the blocks between the elementary school and home, I would sometimes run, pushing a basketball out ahead of me, relishing the curious elastic echo of the orange rubber ball that occasionally returned to my small hands from the uneven, cracked squares of cement. Today the challenge is more than dribbling on an uncertain surface. There are five BYU employees trying to take the ball away. Now, three times a week, on the last hardwood court of the fieldhouse, the bounce of the ball from my youth punctuates the pace of a perpetual pickup game. 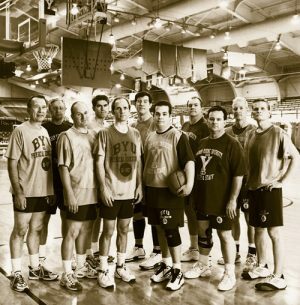 None of these are professional athletes, but professionals and athletes who shed their ties and desk jobs for gray-and-blue BYU issue and some exercise. Guys from offices all over campus show up to play on their lunch break. A few years ago, Gatorade enticed us with a clever jingle, hinting that by drinking its bright beverage, we could "be like Mike." For a long time I dreamed of playing basketball like Michael Jordan. But the last five years I've had time to reflect, and I've had a change of heart. I want to be like Fred. Fred works at Cougar Creations—if you have ever had a color copy made there, he likely had a hand in it. And when you drive "to the hole" with a basketball, your arm will likely have his hand on it. Fred rarely misses a game, so I was surprised last year when he disappeared for a while. When I asked around I learned he had gone to Seattle to give one of his kidneys to his brother. It took him a few months to recover, but now he's back and playing as solidly as ever. There's a smile on his face as he passes the ball to a teammate—another nice assist. That kind of unselfishness is why, more than Mike, I want to be like Fred. But it's not just Fred. It could be any one of a number of guys who, health and injury permitting, just keep showing up—among them Gary, Kay, Lanny, Kenny, Dwight, and Ralph. In years they may no longer be considered young, but you would not be able to accurately guess their ages by appearances or abilities. I would gladly trade my jump shot for any of theirs, lovely arcs guided to the rim's center by the precision of muscles honed by time and practice. Playing in the fieldhouse puts us in close proximity to BYU's coaches and athletes. Every year we are inspired by both the public performances and private practices of those dedicated athletes. While we compete in a different way, we understand the preparation and the joy of being part of a team. In some ways our group is like a family. We spend quality time together. Sometimes we argue, but most of the time we laugh. And while we call more fouls than we ought to, it keeps the game moving along. The other day we played hard, and each team won two of the four short games. There were more passes than points. I think everybody scored, and I know everybody (at least those on the other team) got fouled. No one complained when another player took a shot; instead, they hustled for rebounds. For a time individuals disappeared and there were just teams. When someone lost, there were four other guys who lost with him. Winners and losers shared a graceful exit from the court. The spirit of teamwork continues when the game is over. In campus offices these professionals and their colleagues work with the same boundless energy and sense of unity displayed on the basketball court. They will never be NBA superstars, their talent on display before a roaring crowd of fans. They are team players, realizing that wherever you work or play, satisfaction comes from always showing up and doing your part. They have taught me that there comes a time in life when you would rather pass to a teammate and watch him succeed than dribble alone. I want to be like them.